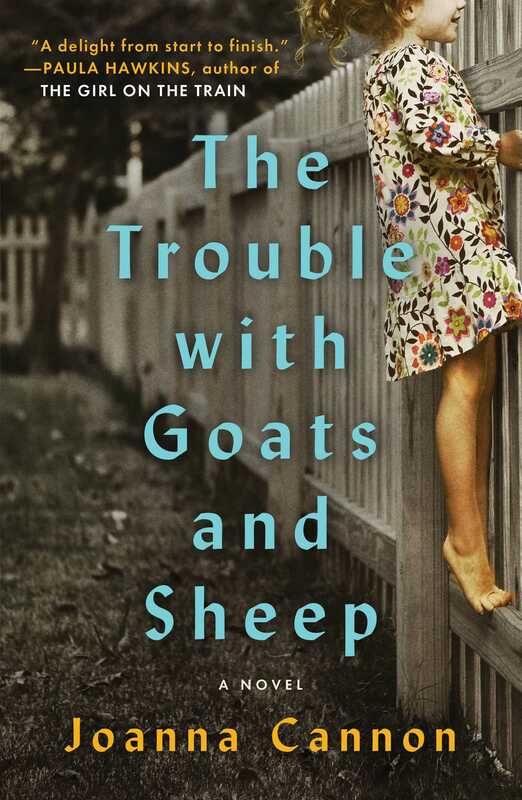 Part coming-of-age story, part mystery, The Trouble with Goats and Sheep is a quirky and utterly charming debut about a community in need of absolution and two girls learning what it means to belong. England, 1976. Mrs. Creasy is missing and the Avenue is alive with whispers. The neighbors blame her sudden disappearance on the heat wave, but ten-year-olds Grace and Tilly aren’t convinced. As the summer shimmers endlessly on, the girls decide to take matters into their own hands. Inspired by the local vicar, they go looking for God—they believe that if they find Him they might also find Mrs. Creasy and bring her home. Spunky, spirited Grace and quiet, thoughtful Tilly go door to door in search of clues. The cul-de-sac starts to give up its secrets, and the amateur detectives uncover much more than ever imagined. As they try to make sense of what they’ve seen and heard, a complicated history of deception begins to emerge. Everyone on the Avenue has something to hide, a reason for not fitting in. In the suffocating heat of the summer, the ability to guard these differences becomes impossible. Along with the parched lawns and the melting pavement, the lives of all the neighbors begin to unravel. What the girls don’t realize is that the lies told to conceal what happened one fateful day about a decade ago are the same ones Mrs. Creasy was beginning to peel back just before she disappeared. Mrs. Creasy disappeared on a Monday. I know it was a Monday, because it was the day the dustbin men came, and the avenue was filled with a smell of scraped plates. “What’s he up to?” My father nodded at the lace in the kitchen window. Mr. Creasy was wandering the pavement in his shirtsleeves. Every few minutes, he stopped wandering and stood quite still, peering around his Hillman Hunter and leaning into the air as though he were listening for something. “Grace Elizabeth!” My mother turned from the stove so quickly, flecks of porridge turned with her and escaped onto the floor. We all watched Mr. Creasy stare into people’s gardens, as though Mrs. Creasy might be camping out in someone else’s herbaceous border. My father lost interest and spoke into his newspaper. “Do you listen in on all our neighbors?” he said. “Mr. Forbes was in his garden, talking to his wife. My window was open. It was accidental listening, which is allowed.” I spoke to my father, but addressed Harold Wilson and his pipe, who stared back at me from the front page. I watched my mother’s face argue with a smile. They assumed I didn’t understand the conversation, and it was much easier to let them think that. My mother said I was at an awkward age. I didn’t feel especially awkward, so I presumed she meant it was awkward for them. “How can someone just disappear?” I watched Mr. Creasy marching up and down the pavement. His shoulders were heavy and he studied his shoes as he walked. “Sometimes people get confused and need their own space.” My mother spoke to the stove. My mother looked over at me as though she were considering whether the last bit made any difference at all, and then she spooned porridge into a large bowl with purple hearts all around the rim. Remington padded into the kitchen. He used to be a Labrador, but he’d become so fat, it was difficult to tell. “She’ll turn up,” said my father. He’d said the same thing about next door’s cat. It disappeared years ago, and no one had seen it since. Tilly was waiting by the front gate, in a sweater which had been hand-washed and stretched to her knees. She’d taken the bobbles out of her hair, but it stayed in the exact same position as if they were still there. “The woman from number eight has been murdered,” I said. We walked in silence down the avenue, until we reached the main road. We were side by side, although Tilly had to take more steps to keep up. “Who lives at number eight?” she said, as we waited for the traffic. I whispered, in case Mr. Creasy had extended his search. We crossed the road opposite the alley next to Woolworth’s. It wasn’t yet nine o’clock, but the pavements were dusty hot, and I could feel the material of my shirt sticking to the bones in my back. People drove their cars with the windows down, and fragments of music littered the street. When Tilly stopped to change her school bag to the other shoulder, I stared into the shop window. It was filled with stainless-steel pans. “Who murdered her?” A hundred Tillys spoke to me from the display. We climbed the cobbles in sandals which flapped on the stones. In winter ice, we clung to the rail and to each other, but now the alley stretched before us, a riverbed of crisp packets and thirsty weeds, and floury soil which dirtied our toes. “Why are you wearing a sweater?” I said. Tilly always wore a sweater. Even in scorched heat, she would pull it over her fists and make gloves from the sleeves. Her face was handkerchief-white, and sweat had pulled slippery, brown curls onto her forehead. “When is she going to stop worrying?” It made me angry, and I didn’t know why, which made me even angrier, and my sandals became very loud. She stared at me. It was difficult to read Tilly’s thoughts. Her eyes hid behind thick, dark-rimmed glasses, and the rest of her gave very little away. “Okay,” she said, and took off her glasses. She pulled the sweater over her head, and, when she appeared on the other side of the wool, her face was red and blotchy. She handed me the sweater, and I turned it the right way, like my mother did, and folded it over my arm. The sweater smelled of cough medicine and unfamiliar soap. I carried it all the way to school, where we dissolved into a spill of other children. I have known Tilly Albert for a fifth of my life. She arrived two summers ago in the back of a large, white van, and they unloaded her along with a sideboard and three easy chairs. I watched from Mrs. Morton’s kitchen, while I ate a cheese scone and listened to a weather forecast for the Norfolk Broads. We didn’t live on the Norfolk Broads, but Mrs. Morton had been there on holiday, and she liked to keep in touch. Mrs. Morton was minding me. Will you just sit with Grace while I have a little lie-down, my mother would say, although Mrs. Morton didn’t sit very much at all, she dusted and baked and looked through windows instead. My mother spent most of 1974 having a little lie-down, and so I was minded by Mrs. Morton quite a lot. I stared at the white van. “Who’s that then?” I said, through a mouthful of scone. Mrs. Morton pressed on the lace curtain, which hung halfway down the window on a piece of wire. It dipped in the middle, exhausted from all the pressing. “That’ll be the new lot,” she said. I peered out. There were two men, but they wore overalls and were busy. The girl who had appeared from the back of the van continued to stand on the pavement. She was small and round and very pale, like a giant, white pebble, and was buttoned into a raincoat right up to her neck, even though we hadn’t had rain for three weeks. She pulled a face, as though she were about to cry, then leaned forwards and was sick all over her shoes. “Disgusting,” I said, and took another scone. By four o’clock, she was sitting next to me at the kitchen table. I had fetched her over because of the way she sat on the wall outside her house, looking as though she’d been misplaced. Mrs. Morton got the dandelion and burdock out, and a new packet of Penguins. I didn’t know then that Tilly didn’t like eating in front of people, and she held on to the bar of chocolate until it leaked between her fingers. Mrs. Morton spat on a tissue and wiped Tilly’s hands, even though there was a tap three feet away. Tilly bit her lip and looked out of the window. “Who are you looking for?” I said. “You’re not looking for your father?” said Mrs. Morton, who was nothing if not an opportunist. “Actually, I think it might be Bournemouth,” said Tilly. We spent our summer holiday at Mrs. Morton’s kitchen table. After a while, Tilly became comfortable enough to eat with us. She would spoon mashed potato into her mouth very slowly, and steal peas as we squeezed them from their shells, sitting over sheets of newspaper on the living room carpet. “Don’t you want a Penguin or a Club?” Mrs. Morton was always trying to force chocolate on to us. She had a tin-full in the pantry and no children of her own. The pantry was cavernous and heaved with custard creams and fingers of fudge, and I often had wild fantasies in which I would find myself trapped in there overnight and be forced to gorge myself to death on Angel Delight. Mrs. Creasy was still missing on Tuesday, and she was even more missing on Wednesday, when she’d arranged to sell raffle tickets for the British Legion. By Thursday, her name was being passed over garden fences and threaded along the queues at shop counters. What about Margaret Creasy, then? someone would say. And it was like firing a starting pistol. My father spent his time stored away in an office on the other side of the town, and always had to have the day explained to him when he got home. Yet each evening, my mother asked if he had heard any news about Mrs. Creasy, and each evening he would sigh from the bottom of his lungs, shake his head, and go and sit with a bottle of pale ale and Kenneth Kendall. On Saturday morning, Tilly and I sat on the wall outside my house and swung our legs like pendulums against the bricks. We stared at the Creasys’ house. The front door was ajar, and all the windows were open, as if to make it easier for Mrs. Creasy to find her way back inside. Mr. Creasy was in his garage, pulling boxes from towers of cardboard, and examining their contents one by one. “Do you think he murdered her?” said Tilly. “I expect so,” I said. “She does now,” I said. Mr. Creasy began on another box. With each one, he was becoming more chaotic, scattering the contents at his feet and whispering an uncertain dialogue to himself. “He doesn’t look like a murderer,” said Tilly. The smell of hot tarmac pinched at my nose, and I shifted my legs against the warmth of the bricks. There was nowhere to escape the heat. It was there every day when we awoke, persistent and unbroken, and hanging in the air like an unfinished argument. It leaked people’s days onto pavements and patios and, no longer able to contain ourselves within brick and cement, we melted into the outside, bringing our lives along with us. Meals, conversations, arguments were all woken and untethered and allowed outdoors. Even the avenue itself had changed. Giant fissures opened on yellowed lawns and paths felt soft and unsteady. Things which had been solid and reliable were now pliant and uncertain. Nothing felt sure anymore. The bonds which held things together were destroyed by the temperature—this is what my father said—but it felt more sinister than that. It felt as though the whole avenue was shifting and stretching, and trying to escape itself. I watched Mr. Creasy. He had run out of boxes, and was crouched on the floor of his garage, still and silent, and surrounded by debris from the past. “I think it probably does,” I said. I looked at the sky, which sat like an ocean above our heads. It wouldn’t rain for another fifty-six days. This readering group guide for The Trouble with Goats and Sheep includes an introduction, discussion questions, and ideas for enhancing your book club. The suggested questions are intended to help your reading group find new and interesting angles and topics for your discussion. We hope that these ideas will enrich your conversation and increase your enjoyment of the book. One summer day in 1976, Margaret Creasy disappears, disrupting the quiet lives of her neighbors on the avenue. Her husband is sure she’ll be back before long; the rest of the neighborhood blames it on the record heat wave they’re suffering. But the longer Mrs. Creasy is gone, the more people start to whisper about what made her leave. After a sermon from their local vicar, two girls, Grace and Tilly, decide to look for God. Their search brings them to every house on the cul-de-sac, and as they question their neighbors, they inadvertently touch on old wounds and long-kept secrets, forcing the inhabitants of the avenue to face the past and admit that they might just know what happened to Mrs. Creasy. 1. Why do you think Joanna Cannon set the novel during England’s heat wave of 1976, and what effect does the weather have on her characters? 2. What do you think of Walter Bishop when he is first introduced? How accurate or extreme are his neighbors’ views of him? Did reading The Trouble with Goats and Sheep make you think about how you judge others? 3. Is a small community like the avenue more a force for evil or for good? 4. How do the different characters in the novel carry their secrets? How does this reflect your experience among your friends and family? 5. Who do you think is the better detective, Grace or Tilly? How do their distinct personalities impact their sleuthing? 6. Do you think Dorothy Forbes really has difficulty with her memory? How does her relationship with her husband Harold affect that? 7. The avenue inhabitants have many different versions of the same story. What motivates each of them? 8. Consider the image on the drainpipe. Was it a divine message, or somehow spiritual? Why or why not? 9. The events of the summer of 1976 are formative for Grace and Tilly. Can you think of a particular summer memory from your childhood that left a lasting impression on you? 10. “The world is full of goats and sheep. You just have to try and work out which is which” (page 195). Who are the goats and who are the sheep at the end of the novel? 1. Imagine what happened when Mrs. Creasy returned to the avenue, and discuss your ideas with the group. 2. Grace and Tilly’s summer days can be measured out in television programs and spoonfuls of Angel Delight. Get nostalgic and think back to your own childhood summer vacations: what were the cultural moments, treats, or experiences that define those memories for you? Joanna Cannon is a psychiatrist with a degree from Leicester Medical School. She lives in England’s Peak District with her family and her dog. She is the author of Three Things About Elsie and The Trouble with Goats and Sheep, a top ten bestseller in the UK. "A unique and unforgettable debut... a closed-community mystery not just in an Agatha Christie sense but in the more ambitious J.B. Priestley manner: a spiritual parable whose larger questions echo even after being answered." 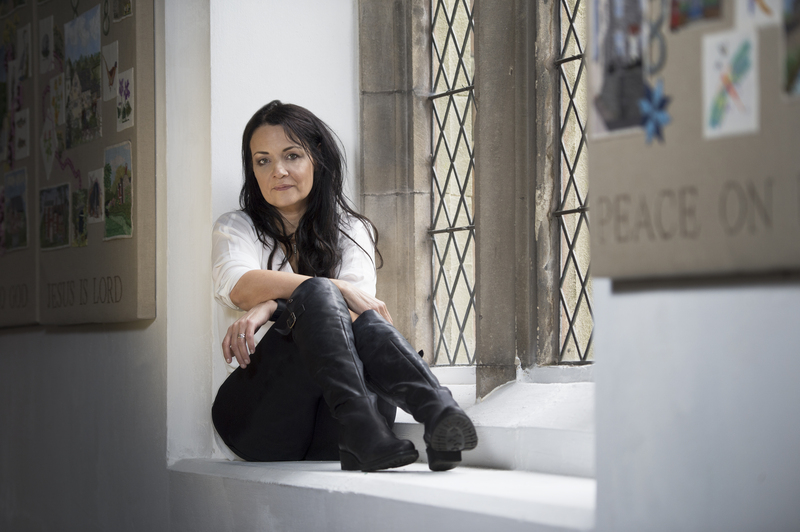 "A captivating new voice in British fiction. Not since Nathan Filer's The Shock of the Fall has a debut novel held the promise of such an exciting career ahead. One of the standout novels of the year." "An utter delight. Perceptive, funny, dark, moving. And so beautifully written. I loved it." "Joanna Canon's interrogation of hypocrisy and prejudice is insightful and compassionate… I didn't want the book to end." "A stunning debut with wonderfully drawn characters. Joanna Cannon is one to watch." "Part whodunnit, part coming of age, this is a gripping debut about the secrets behind every door." "This cautionary tale of a suburban power struggle is charming and truthful, at once ambitious and intimate, with playful prose that reveals an intriguing mind at work." "A masterfully constructed plot... This understated, somewhat quirky debut novel is remarkable for its structure, characterizations, pitch-perfect prose, touches of humor, and humanity. Cannon is an author to watch." "A thoughtful tale of loyalty and friendship, family dynamics and human nature." "Masterful... a must read. Cannon’s prose is simply electric... literary fiction at its best." "We get to know the villagers intimately, the author writing with imagery that paints pictures with words... This mystery will keep you guessing until the end... it’s well worth a read." "Reminiscent of Scout Finch with shades of Flavia de Luce, 10-year-olds Grace and Tilly spend the sweltering summer of 1976 investigating two mysteries... Quirky characters, playful language and humor offset the tension. The child detectives may have gotten themselves into more than they bargained for, but their adventure leads their street toward closer community and the novel to an upbeat conclusion."